Ever watched any film or television show that features a keen eye into the mystical lands of ancient Egypt? If so, you’ve been plunged into a world of powerful magic that is wrapped up in more mystery than any other mythology. Mummies rise up from ancient entombment either to guard their pyramids or crypts or perhaps arising from a curse that afflicts both them and those who look upon them. The gods watch over the land, demanding attentive worship while conniving amongst themselves at a rate that would have the Olympian pantheon tuning in daily to keep up on the drama. And the pharaohs, too, have their own enigmatic legacies. One never is sure they know the full story of anything that comes of the old sands. But… that won’t happen to you! That happens to other dark pharaohs. The type who aren’t connected to the real world, who haven’t earned their long-lasting power and life! 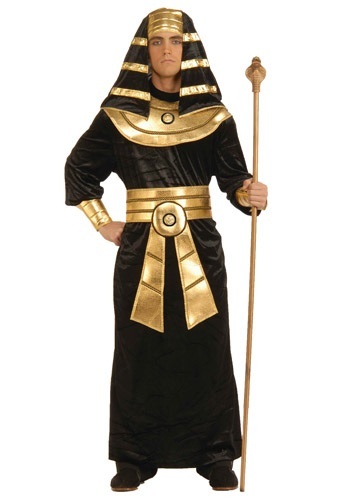 So, you have no fear in this Adult Black Pharaoh costume. The shining black robe provides a dark and mysterious base when contrasted with the golden finish of the belt and iconic regal collar. The matching black and gold headpiece frames your noble face and demands respect from your subjects. Now you only need acquire your mystical scepter and your immortality is ensured. Otherwise… there is always a mummy costume for next year!